From Borussia Dortmund's form slump to Bayern Munich's hot streak - we break down the vital Bundesliga Matchday 12 statistics. Yunus Malli scored his first brace in a Wolfsburg shirt, and chipped in with a pair of assists in one game for the first time in his Bundesliga career. The Wolves beat Freiburg 3-1. Schalke are second in the Bundesliga table for the first time in five years. Defeat to Stuttgart was Dortmund's third in a row - their longest such run in three years. Hertha Berlin and Cologne have each conceded a league-high five penalties so far this season. Six penalties were awarded on Matchday 12, equalling the season-high record set on Matchday 9. Hoffenheim have scored a season-high seven goals in the last quarter of matches, including four in added time. Mark Uth struck to salvage a point against Eintracht Frankfurt. Victory over Augsburg was league leaders Bayern's eighth on the bounce in all competitions - five in the Bundesliga, two in the UEFA Champions League and one in the DFB Cup. Hamburg defender Kyriakos Papadopoulos is the only player in the Bundesliga to have been booked seven times already this season. Following their 1-0 defeat to Mainz, Cologne have failed to score in eight of their 12 Bundesliga games this term - more often than over the course of the entire 2016/17 campaign. Hertha, who lost 4-2 to Borussia Mönchengladbach, have not kept a clean sheet in their last 11 matches - their longest such run under Pal Dardai. Frankfurt's Kevin-Prince Boateng scored his second goal of the season. As was the case against Gladbach on Matchday 3, the Ghanaian struck in the 13th minute. Bremen's 4-0 victory over Hannover was their first league win in six months, ending a 14-game winless run. Stuttgart remain unbeaten on home soil in 2017 (12 wins and three draws). Bayer Leverkusen have scored at least once in their last 17 games in a row - the longest such run of any Bundesliga club. Die Werkself twice came from behind to draw with RB Leipzig. Lewandowski has scored more goals against Augsburg than against any other Bundesliga club: 18 in 13 games. Stuttgart's Ron-Robert Zieler saved his first Bundesliga penalty at the 23rd attempt, although Dortmund scored from the rebound. Bayern midfielder Arturo Vidal scored his 25 Bundesliga goal. Lewandowski has scored at least twice in 44 Bundesliga games. Only Gerd Müller and Heynckes have scored more than once in single games more often. Gladbach have picked up 50 points from 30 games under Dieter Hecking - an average of 1.7 points per game. Only Hennes Weisweller and Udo Lattek have fared better in the Borussia dugout. Freiburg covered a season-record 128.8 kilometres of ground in defeat to Wolfsburg. Daniel Baier become Augsburg's record Bundesliga appearance holder (200) in the 3-0 loss at Bayern. Heynckes celebrated his 500th win in the Bundesliga as a player and coach with this triumph, the most ever. His first win came on 21 August 1965, Heynckes scoring the first two goals in Gladbach's 5-0 home win against Tasmania Berlin. Stuttgart recorded their 500th home win the Bundesliga. Only Bayern, Hamburg and Werder Bremen have picked up more victories on their own patch. Franco Di Santo's opener for Schalke against Hamburg was his first Bundesliga goal since the beginning of March 2016. He had gone 25 matches, or 1054 minutes on the pitch without finding the net. 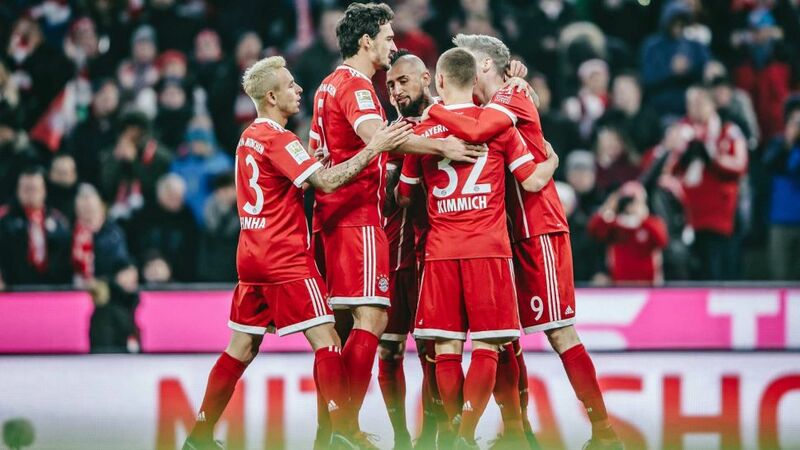 Bayern are the first team to break through the 3000-point barrier in the all-time Bundesliga standings.